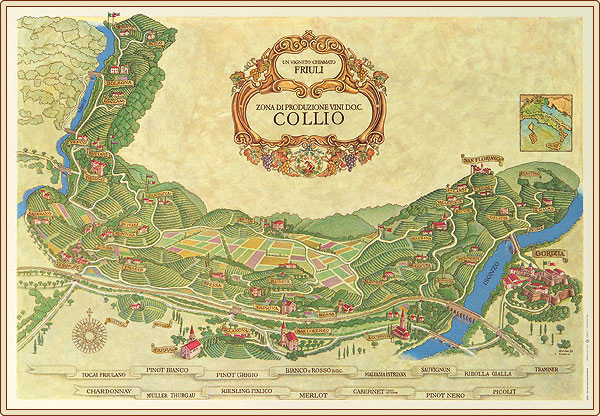 So we start with the "Collio" zone, in The Friuli Venezia Giulia region, in the North-East of Italy. The Collio is situated at the extreme eastern edge of the region, in the province of Gorizia on the border with Slovenia. Collio is an area of production of fine wines to which, among the first in Italy, has been recognized since 1968 the Appellation d'Origine Subsidiary. A premium-quality wine area, the Collio was one of the first in Italy to be recognised, as a Denominazione d’Origine Controllata and Garantita, or DOC DOCG zones. The D.O.C. Collio area, known for its excellent production of D.O.C. wines, covers about 1600 hectares of specialized hill vines which extend along the northern hill area of the province of Gorizia next to the border with Slovenia. The vines which are cultivated today on the Collio are mostly of French origin, imported from 1850 onwards. The proximity to the Giulie PreAlps leads to shelter from the northern winds and the propinquity to the Adriatic coast promotes the persistence of a moderate and mild micro climate. From the hills of San Floriano and Oslavia above those of Gorizia Ruttars, Lonzano and Vencò on the banks of Idrija, which once marked the border between Italy and Austria, is a succession of rolling hills punctuated by small villages, and vineyards, which stretch for about 1,600 hectares. The Collio soils are made up of marls and sandstones from a eocene origin, brought to the surface in ancient times by the lifting of the Adriatic seabed. These rock formations easily break up under the action of atmospheric agents, creating a soil which, over the seasons, turns into an ideal substratum for viticulture. Alongside the soil, there is another excellent ally which is the climate. Ventilation is constant and abundant rain is well distributed over the year, creating a water supply in the superficial layers of the land which guarantees the ideal water supply even in the hottest periods. Moreover, the hill conformation of the area leads to discrete temperature changes between day and night. These conditions promote the accumulation of sugars, pigments and aromatic substances in the grapes which characterize and make the Collio wines very typical. You can find soft and elegant notes in the reds, with warm, round sensations. In the whites, the freshness of the “in bianco” winemaking predominates, a method without contact with the skins, which characterizes their dry and harmonious flavour. This hilly area-perfect for relaxing holidays in the green, thanks to its excellent infrastructure-rural tourism is developed almost continuously along an ideal east-west, showing large areas exposed to the south, very suitable for viticulture highly qualified. This situation has favored since ancient times the cultivation of the vine, already introduced in the area in pre-Roman times. Of great white wines, the Collio prevail the production of Pinot, Tocai Friulano, Sauvignon and the renowned Collio Bianco, a blend DOC. Among the reds are Collio Rosso, Cabernet, and Merlot. And these will be described in the dedicated pages, linked below. With this itinerary we have the possibility to introduce you the principle villages/cities of Collio and we can give you a brief description of these. It starts from the Isonzo Park, just outside Gorizia, and continues north through the nearby Parco Piuma, a hilly section of the old park, to Oslavia, where the vineyards do not hide the signs of First World War fights, whose victims are resting In the nearby Ossuary. Continuing along the main road you enter the hills cultivated with vines and cherries until you reach the village of San Floriano del Collio, dominated by the castle complex of the Conti Formentini. After San Floriano here you go along the state border towards Ruttars, in Dolegna del Collio, crossing the Plessiva Forest, a nature reserve. Ruttars dominate the vineyards and the vineyards, whose sites surround the Castle of Trussio and the Marquard Tower. Along the way we meet the Ca 'Ronesca Farm, where you can taste the Doc Chardonnay Collio, Pinot Grigio Collio and Sauvignon Collio. 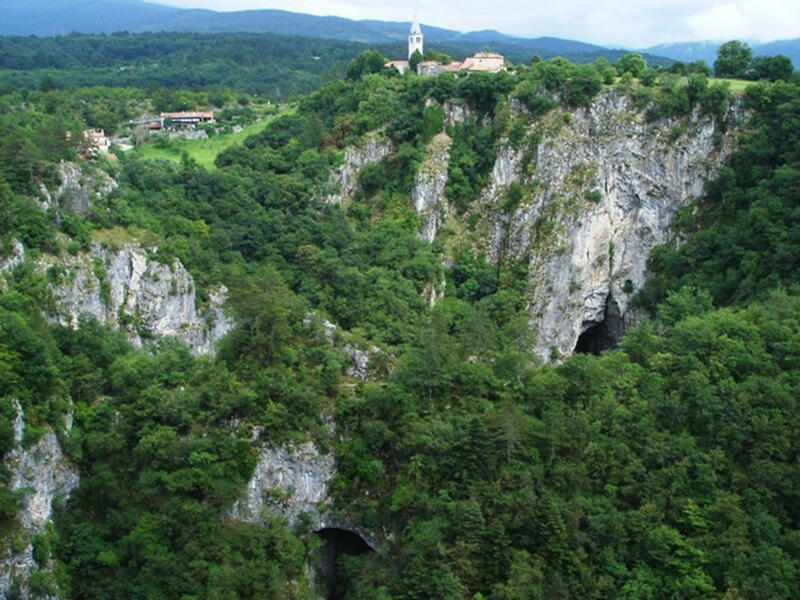 Always following the border with Slovenia you will arrive in the center of Dolegna del Collio, a country known for producing wines for traditional game-based cooking. Turning back to Craoretto and then Brazzano, with the suggestive Church of San Giorgio rises on the highest hill in the area. Continuing to get down the road you arrive at Cormòns, the putative capital of the area of ​​the Collio Gorizia and an important center of the wine-growing industry. 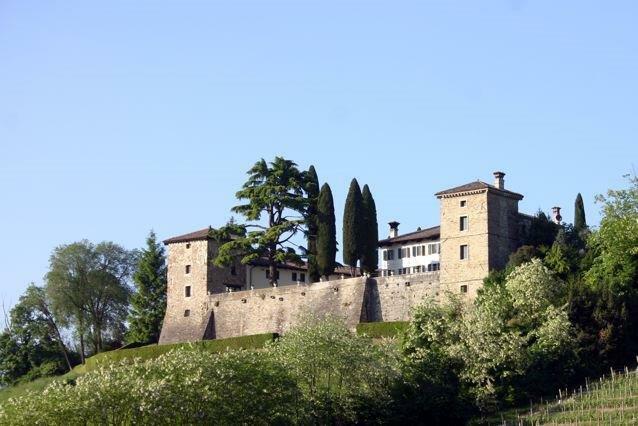 Continuing to reach Gorizia, you arrive at Capriva del Fiuli, a town surrounded by vineyards where you can admire the Castello di Spessa and Villa Russiz. Here stands the Fondazione Villa Russiz and the Castello di Spessa, a historic wine cellars that produces Collio Friulano, Collio Chardonnay, Collio Malvasia, Collio Pinot Bianco, Collio Pinot Grigio, Collio Ribolla Yellow, Collio Merlot and Collio Sauvignon Doc. The road bends east to cross Mossa, a very ancient settlement where you can admire some of the votive churches dating from the thirteenth century. 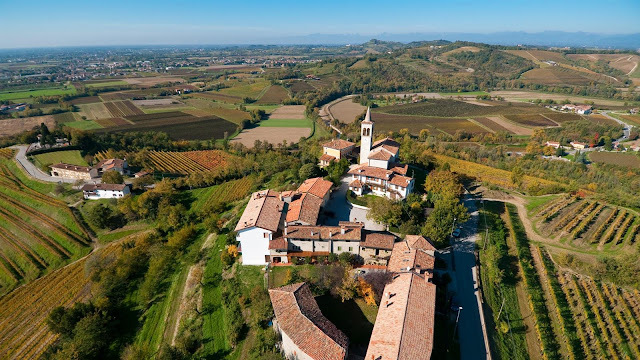 A stop at Lucinico, just before entering the urban area of ​​Gorizia and heading to the Isonzo Park, from where it left, will give you the chance to taste the typical wines and sausages of the area. In this following chapter we will describe you the most important characteristics about the principle vines and wines of Collio. Vine characteristic: Mid ripening, rather vigorous,suited to clay-limestone soils but also performs well on sandy soils if there is no water stress. Small berries. Very similar to cabernet sauvignon but with less dramatically indented leaves. Buds and matures earlier than Cabernet Sauvignon and thus more prone to coulure but easier to ripen fully. Very Hard wood and small berries. Vine characteristic: Vigorous, late budding, mid to late ripening. &Thrives on well-drained gravel soils, preferably acid and well exposed. Very susceptible to fungal diseases that affect the wood such as eutypa dieback and esca and also to powdery mildew. Occasionally susceptibile to drying out of the stems. Bunches and berries are small, the skins thick and distinctively blueish. Its hard wood makes it suitable for mechanical harvesting and generally safe from the risk of winter freeze. Wine characteristic: Wine has a particurlarly powerful identity. Thanks to the small, thick-skinned grapes, the wines tend to be deep in colour, high in tannin and relativity high in acidity. There is a recognizable nobility and stability to its aroma which can vary from blackcurrant to cedar, although such is its affinity with oak that in young wines it can be difficult to dissociate the fruit dfrom the wood. Vine characteristic: Early budding, mid ripening. Moderately, sometimes very, vigorous with a tendency to produce many shoots and suckers. Fertile and best if short pruned. Prone to coulure in some climates. Well suited to clay-limestone soils. At risk of winter and spring frost and drought. Very susceptible to downy mildew and leafhoppers. More susceptible to botrytis bunch rot than the Cabernets, with wich iti si so frequently grown. Wine characteristic: Because it is easier to ripen, Merlot is grown even more widely than cabernet sauvignon, and swetness and freshness of its wine make it particurarly easy to appreciate. Like its relatives Cabernet Sauvignon and Cabernet franc, it can exhibilt a certain herbaceousness if not fully ripe, though this is much less common with Merlot than with either Cabernet. In general, a very considerable proportion of all the Merlot grown worldwide is blended with either or both Cabernet to provide fruit and flesh to counterbalance their more tannic structure. Vine characteristic: Early budding, therefore susceptible to spring frosts and coulure, and early ripening. Likes temperature climates and does well on calcareous-clay soils. In hot climates, it ripens too quickly and the relatively thin-skinned barries tend to shrivel and are subject to sunburn. Best when fertility and yields are restricted, especially for the higher-yielding, larger -berried clones. tends to produce a lots of small bunches. Delicate and supscetible to downy and powdery mildews, botrytis bunch rot and virus diseases, notably fanleaf and leafroll, and at risk from leafhoppers. 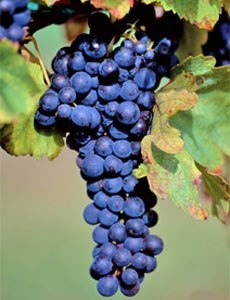 Wine characteristic: In contrast to Cabernet's trademark tannins, most Pinot Noir is relatively soft, fruity and easy to like. Grat grand cru red burgundy can be tough in its youth and need a decade or two for its ineffable complexities to unfurl but, in general, charm is one of the Pinot Noir's grat assets. In youth it can taste of cherries, raspberries and a wide range of other fruits. Vine characteristic: Had almost disappeared in the early twentieth century after Fruili was hit by phylloxera. It was reswcued in the 1970s from a vineyard in the abbey of Rosazzo, where a entire row of old and ungrafted Pignolo vines had miraculously survived. Wine characteristic: Varietal Wines have fresh acidity and firm but silky tannins, with fruit flavours that range from small red berries to ripe plums, developing notes of liquorice over time. They are well suited to oak ageing. Vine characteristic: Early budding and ripening, productive. Easy to grow. Best suited to soils dominated by limestone or calcareous clay that are not to dry. Susceptible to powdery mildew and grapewine yellows. It may also suffer from coulute and millerandage. Relatively thin skins make it susceptible to botrytis bunch rot in rainy harvest. 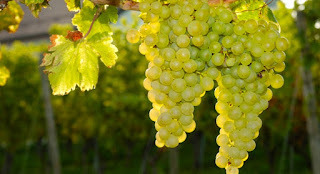 Wine characteristic: Chardonnay, loved or reviled, is arguably the most versatile white wine grape. Without a domint flavour of its own, it can take on a wide array of aromas depending on where it is grown and, paticularly, how it is made. 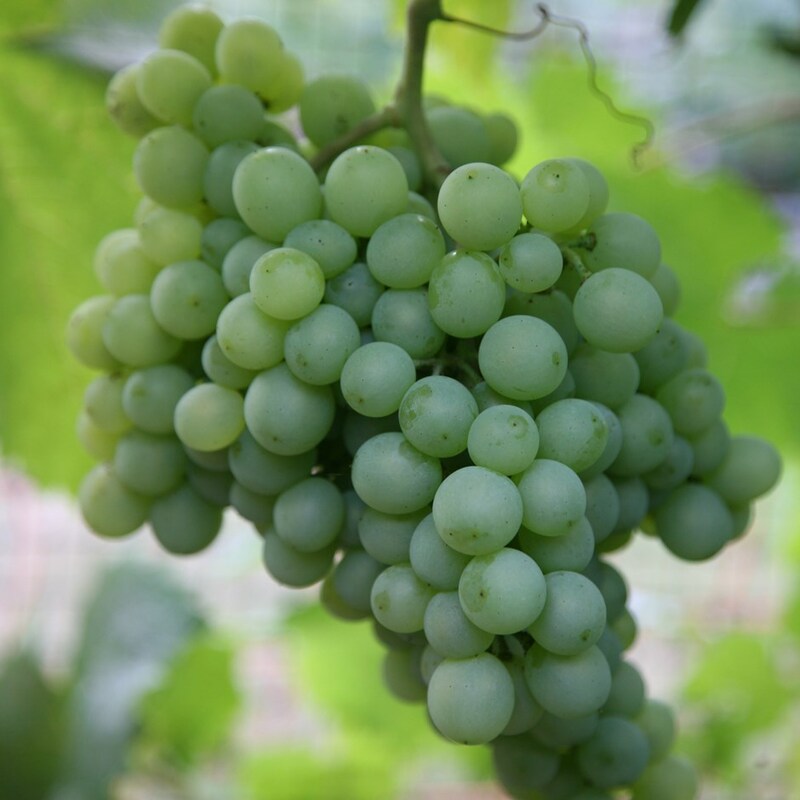 Although the grapes generally reach relatively high sugar levels, the wines can taste lean, even tart, almost like a sauvignon blanc in its refreshing effect, in cool climate. Vine characteristic: Vigorous but low yielding because Picolit flowers often produce sterile pollen, making cultivation difficult and producing loose bunches with very few berries. It needs to be planted together with other varieties such as Verduzzo Friulano to improve berry set. Although it ripens at the end of September or the beginning of October, it is usually hervested much later. Wine characteristic: Many wines are less impressive than one might expect considering the prices they achive but recommended produces include Ronchi di Cialla, Dorigo, Livio Felluga, Moschioni and Livon. The best are delicately sweet with floral aromas and the flavour of apricos and peaches, sometimes a little honeyed. Wines aged for more than two years may be labelled Riserva. Vine characteristic: Early budding and early ripening. Fairly vigorous and more regularly productive than Pinot Gris or Pinot Noir. Likes deep, warm soils. Good cold resistance but rather delicate in relation to fungal diseases. Small berries. Wine characteristic: Admires of freshness in wine can find some Pinot Gris overbearing whereas, in the right place and hands, Pinot Blanc can offer a lip-smacking halfway house between refreshment and opulence. The wines are moderately structured and have moderate acidity and may be used for sparkling wine. 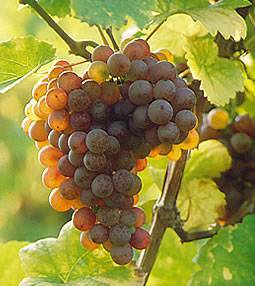 Wine characteristic: When Pinot Gris' yields sre not too high and it is allowed to reach full ripeness it can produce deep-colored, fairly rich wines with relatively low acidity - occasionally running to flab - and a heady perfume. Wine characteristic: Traditionally, varietal wines have been light-bodied and high in acidity, sometimes slightly floral. More recently, ambitious and innovative producers have been making more concentrated and characterful versions with a deep yellow colour and rich yellow fruit, sometimes nutty and mineral, flavours, although experiments with barrel fermentation and/or ageing have not been universally successful. Vine characteristic: Very cold-hardy, thanks to the hardness of its wood, though it needs to be planted in the best sites to ripen fully and yield economically. It buds late and therefore tends to avoid spring frost. Mid to late ripening, depending on the style of wine being produced. Resistant to downy mildew and only slightly susceptible to powdery mildew and botrytis bunch rot. Wine characteristic: This is not a variety that shows much of its mettle in inexpensive versions but a hand-crafted Riesling is generally relatively low in alchol but high in both acidity and often extract. There is rarely any shortage of flavour and aroma in a Riesling - in fact the bouquet in mature examples can be so strong as to deter some wine drinkers. Because Riesling is so good at expressing the terroir where it is grown, it is difficult to generalize about its aromas and general character. They can be floral, fruity, mineral and/or spicy. One generalization can be made: Riesling makes some of the longest-lived wines in the world. Vine characteristic: Early to mid ripening. Very vigorous and needs to be planted in low-vigiour rootstocks in soils that are not too fertile, otherwise the canopy can be almost iuncontrollable. Small, compact bunches of small berries are highly susceptible to botrytis bunch rot. Wine characteristic: Sauvignon the wine is tipically high in acidity with a lot of aromas generally associated with things green - grass, leaves, nettles and gooseberries. 'Cat's pee on a gooseberry bush' became a popular description of aroma of some early-picked Sauvignon. Vine characteristic: Fertile, vigorous and productive. Early budding and early to mid ripening. Susceptible to botrytis bunch rot, sour rot, esca, downy and powdery mildews. Wine characteristic: Wines often have both herbal and almond flavours, sometimes more on the grassy side, and are neither as crisp nor as aromatic as sauvignon blanc but many well be fuller-bodied. 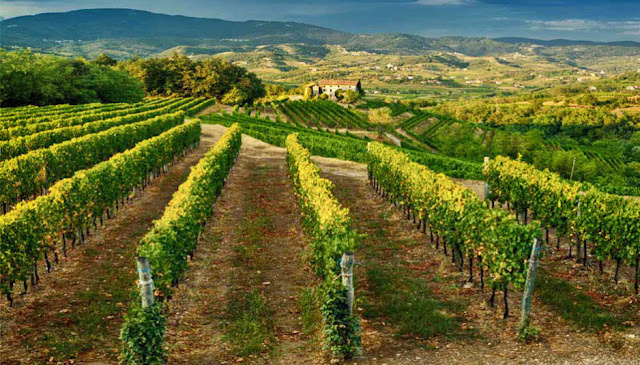 we start to describe more specifically the beautiful areas of Italy where the wine is produced and the its qualities. It is intended to provide a concise and general overview of wine of Italy, and is intended for those who are at the beginning of their oenological knowledge. Italian wines boast over 400 protected designations of origin (PDOs), among which one has chosen to highlight the most important for each region. But first it is good to introduce the type of certification that the Italian state has imposed in order to differentiate the quality of the wines for sale. In the second half of the 20th century, Italy decided to establish a series of laws to safeguard the quality and authenticity of their wine. These safeguards take the form of protected zones where growers and producers must adhere to strict regulations in order to be certified by these laws. The laws also govern things like the type of grapes used, the alcohol content, and how long the wine is aged. Certification falls into three categories of decreasing strictness: DOCG, DOC, and IGT. Denominazione di Origine Controllata e Garantita (DOCG): Seeing this on the label of your wine bottle means that the wine producers followed the strictest regulations possible to make that wine. The wine was tested a committee that then guarantees the geographic authenticity of the wine and its quality. There are currently only a handful of Italian wines that qualify for DOCG status. Denominazione di Origine Controllata (DOC): DOC wines are much more commonly found. The rules governing quality and authenticity are still very strict, but they're a little more generous than those for DOCG status. For instance, the geographic zone might be a little bigger or the rules about what kind of grapes might be a little more relaxed. Indicazione Geografica Tipica (IGT): This designation was created a little after the DOC and DOCG designations in order to accommodate growers who couldn't meet all the DOC or DOCG regulations for one reason or another, but were still producing great wines. 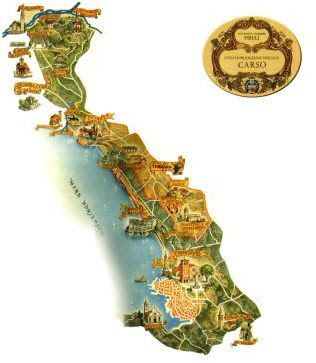 The topic was dealt dividing Italy into the twenty Italian regions, and within them, the most widespread vineyards and the most important wine areas are reported: a great emphasis is put on the link with the territory, giving evidence of the area from which the wine comes. Italy is the country with the largest and most diverse wine production in the world. The climatic conditions, the many varieties of grapes, the geological characteristics and the shape of the territory make the "Bel Paese" the ideal place for the production of quality wines, sometimes of great value, with very different characteristics. When talking about Italian wines, the first ones are the reds of Piedmont or Tuscany: Barolo, Barbaresco, Brunello di Montalcino, Chianti are world-renowned names, the very symbols of Italian wine. 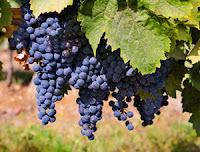 Italy's red wine, however, is not limited to these areas: in every Italian region you can find great red wines produced both with local and international vines: we mention wines such as Taurasi, Amarone della Valpolicella, Romagna Sangiovese , Negroamaro del Salento, Cannonau of Sardinia, Sicilian wines based on Nero d'Avola and, why not, also the various emilian Lambrusco , so much appreciated abroad for versatility and drinkability. White wines are also found in Italy with products of absolute prestige: the whites of Northern Italy are excellent, famous for their minerality and freshness, such as the Friulian ones of Collio or the Colli Orientali, that is Trentino and South Tyrol, rich in perfumes and flavors. To mention, then, the great whites of Southern Italy, full bodied, alcoholic, structured: white wines of Campania, Fiano di Avellino and Greco di Tufo on all, are now known all over the world, and so Sicilian whites are more and more present in the wine list of the most prestigious restaurants. It is also to mention the Italian production of Classical Methods of Sparkling wines, which reached in the areas of Franciacorta, Oltrepò Pavese, Trento and Alta Langa, points of excellence that can compete with the most famous French champagne. Along with these, it is necessary to name sparkling wines with fermentation in autoclave: Asti and Prosecco literally invaded international markets. Finally, they deserve to be named the wines that have been passed: they are innumerable and very high quality, especially those of the big islands, Sicily and Sardinia; those Friulians, then, are no less. This region, with an ancient wine tradition (the city of Aquileia (UD), in Roman times, was the wine-making center for legions allocated in the center of Europe along the Danube and Rhine. 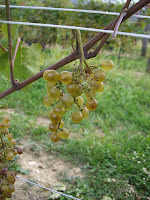 ), is producing mainly white wines, with a reputation of the highest quality. 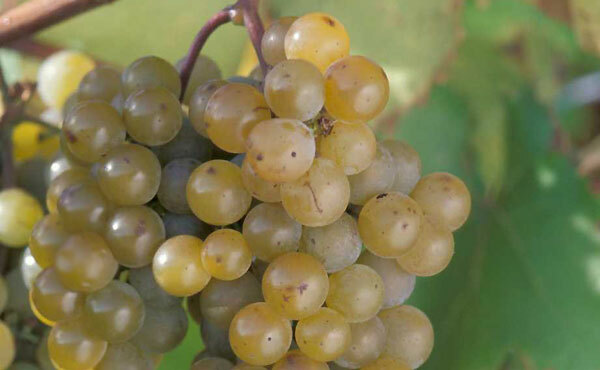 The most important white grape varieties are Verduzzo Friulano, Picolit, Friulano, a grape known in the past as Tocai (According to EU legislation since March 2007, Italy is no longer allowed to produce wine called Tocai, as this name It is reserved for the Hungarian Tokaji Aszú; also the grape has had to change its name), the Ribolla Gialla. Among the red berry vines we remember the Pignolo and the Refosco from the Red Peduncle. International vines are also widespread. Colli Orientali of Friuli and Collio: are two neighboring hilly areas, close to the border with Slovenia, the first in the province of Udine and the second in the province of Gorizia. They are characterized by clay soils, able to preserve moisture for the dry season, exceptionally suitable for the cultivation of white grapes. 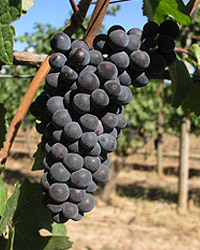 There are also native black grape vines such as the Pinot Noir Black and the Pignolo. Friuli Grave: This is a very large area, embracing the flat areas of the provinces of Pordenone and Udine, cut by the Tagliamento, Isonzo, Torre and Medana rivers. The name comes from the soil type, rather arid, mostly made up of stones and pebbles. There are both white and red wines, both native and international vines. Carso: between Gorizia and Trieste, covering the south-eastern slope of the region. 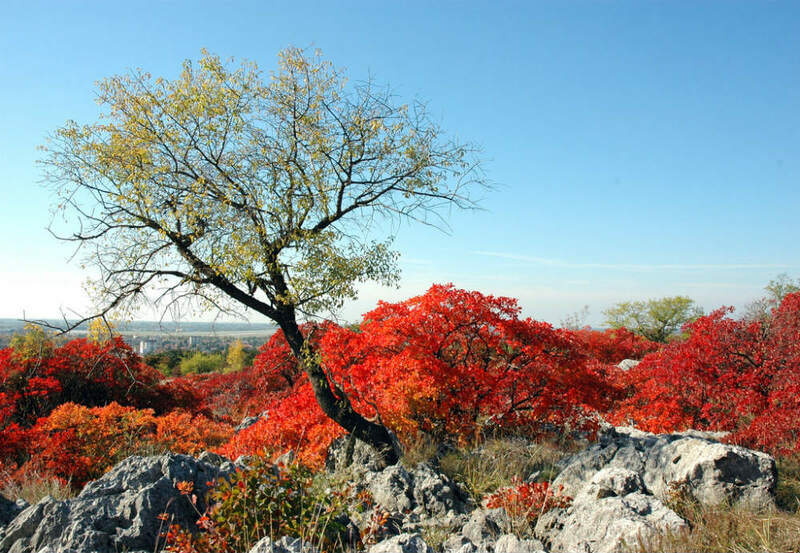 It has a limestone, arid, stony and iron soil. 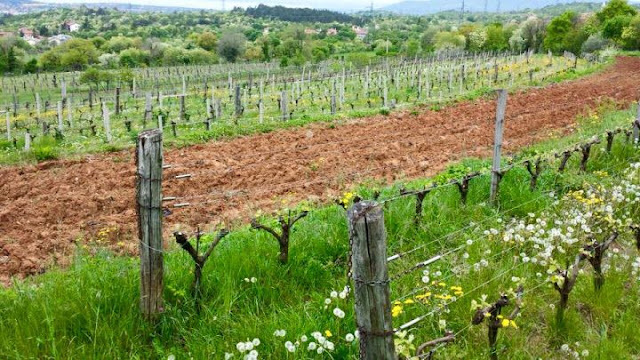 There are, among other things, "border" vines with neighboring Slovenia: Istrian Malvasia and Vitovska, white berries and Terrano, red berries. Veneto is also a region with very orographic and climatic characteristics, with mountainous, hilly and flat areas crossed by many rivers. It is also the Italian region that, with volume intermittence, produces the largest quantity of wines with denomination of origin: about 25% of Italian wines and IGP wines comes from here! The most cultivated red grape variety is Merlot, while Glera and Garganega stand out among white grapes. However, many local vines are more or less indigenous, which are increasingly valued after the fashion of international vines (Merlot, the two Cabernet and Sauvignon Blanc). Among the most important vineyards are the red berries Corvina, Corvinone, Rondinella, Raboso, Rossignola, Tai Rosso4, Marzemino, Molinara, and Garganega white grapes, Nosiola, Vespaiola, Trebbiano di Soave, Durello and Verduzzo Trevigiano. Valpolicella: This area in the province of Verona has become famous worldwide thanks to the AMARONE, dry wine produced mainly from Corvina Veronese and Rondinella grapes (Corvina may be partially replaced by Corvinone, while the use of small quantities of Molinara or other red berries is optional). In this area, with the same grapes, is also produced the RECIOTO DELLA VALPOLICELLA DOCG, red dessert wine, VALPOLICELLA DOC, red wine to drink young, VALPOLICELLA RIPASSO DOC, in fact a more structured VALPOLICELLA since its grapes were "Glimpsed" in the marcs of AMARONE or RECIOTO. Veronese: The area where vine cultivation is widespread: there are many varieties of vines that give rise to different denominations, such as BARDOLINO SUPERIORE DOCG, SOAVE SUPERIORE DOCG, RECIOTO SOAVE DOCG, LUGANA DOC, WHITE CUSTOZA DOC. Within the DOC BARDOLINO is also produced a rose wine, Chiaretto. Breganze: Zone in the province of Vicenza, where, under the DOC name, several white and red wines are produced, among which Torcolato must be mentioned, a sweet wine made from Vespaiola grapes. Conegliano Valdobbiadene: Wine-growing area in the province of Treviso, renowned for its prosection, which can be found in the DOCG with the following denominations: CONEGLIANO VALDOBBIADENE - PROSECCO; CONEGLIANO - PROSECCO; VALDOBBIADENE - PROSECCO. Here is the grape Glera (in the past also called "Prosecco"), which is mainly vinified with sparkling wine with the Charmat method. The Cartizze subzone is traditionally considered to be the highest excellence of Prosecco, which, only if it is vinified here, can qualify as "Superiore". PROSECCO DOC can also be produced in almost all of the Veneto (except the provinces of Verona and Rovigo) and throughout Friuli Venezia Giulia. Mountainous region, covered by the valleys of the rivers Adige and Isarco, along which orchards and vineyards alternate to cover up the territory. The composition of the soil and the climate, characterized by strong thermal excursions between day and night, give the wines freshness and particular minerality, as well as a remarkable richness of perfumes. In this region, international vines (Chardonnay, Riesling, Sauvignon, Pinot Noir, Pinot Grigio, Sylvaner, Müller Thurgau, Gewürztraminer, but also Cabernet, Merlot and Pinot Nero) are very popular, alongside important native varieties Valued: Lagrein, Marzemino, Teroldego, Schiava and Nosiola. Alto Adige: In this very large area, all the vineyards of the region are cultivated, with interesting results for both white wines and red wines: Pinot Nero wines are here considered to be the best in Italy. Of great interest are Lagrein, for which the area of election is considered the one of Gries, near Bolzano. Campo Rotaliano: Along the valley of the Adige, north of Trento, stretches a plain called Piana or Campo Rotaliano, in which is cultivated the native black grape Teròldego, from which is obtained the TEROLDEGO ROTALIANO DOC, fruity even by aging. Trentino: Very wide and diversified is the production of wines in this subregion. Among others, the wines of Marzemino originate, native grape, black berries, a strong ascension and HOLY WINE OF TRENTINO, Nosiola wine, white grape wine. Trento: Although the territory of the two denominations is largely coincident, there is a significant difference between TRENTINO DOC and TRENTO DOC: TRENTO DOC are exclusively sparkling wines. The classic spumante tradition of this area is one of the oldest in Italy, well ahead of FRANCIACORTA. Here, white, or even rosemary sparkling wines are produced with Chardonnay, Pinot Blanc, Pinot Noir, Pinot Meunier. In Lombardia (Lombardy) you can find wines with very different characteristics, thanks to the great variety of soil and the different climatic conditions. The vine is cultivated in mountainous areas, on hilly terrains, beside large lakes and in the Po Valley. Such a large region then shares with the neighboring regions the traditions of cultivation of certain vines: we have Nebbiolo in North, Barbera and Croatina in Pavese, Lambruschi in Mantua. Valtellina: In Valtellina (province of Sondrio), vine cultivation is based on secular traditions: here a heroic viticulture, up to 700 meters above sea level, is practiced on sloping slopes that go down to the valley bottomed by the Adda River, "tame" by man with terraces supported by thousands of miles of dry stone walls. We grow a grape on all, the Nebbiolo, locally called Chiavennasca. With it are made red wines, from aging (VALTELLINA SUPERIORE DOCG), from passito grapes (VALLEY OF VALTELLINA DOCG), or medium body (RED VALTELLINA DOC). Oltrepò Pavese: A wine area already in Roman times, today accounts for more than half of the entire area of ​​Lombardy, and even more than 70% of the Denominations of Origin of the whole region. Here are produced various types of wine, mostly based on native vines: all the traditional BONARDA, obtained with Croatina grapes, the BARBERA, from the same grapes, and other "historical" reds with curious names, such as BUTTAFUOCO and SANGUE DI GIUDA, obtained From assemblies of Croatina, Barbera, Rare and Vespolina grapes. However, in the Oltrepò Pavese a central role is taken by Pinot Nero, a complex and versatile grape variety that has for centuries been one of the areas of Italian excellence in these territories. It is vinified in red, to give elegant wines from medium aging, or in white, to represent the main vine for sparkling wines OLTREPÒ PAVESE CLASSIC DOCG METHOD. 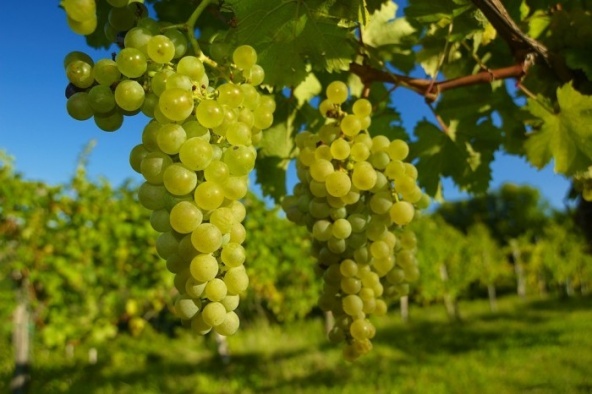 The spumantian vocation of the area also occurs in the use of other white grape varieties such as Riesling, Cortese, Moscato, Malvasia, Chardonnay, Sauvignon. 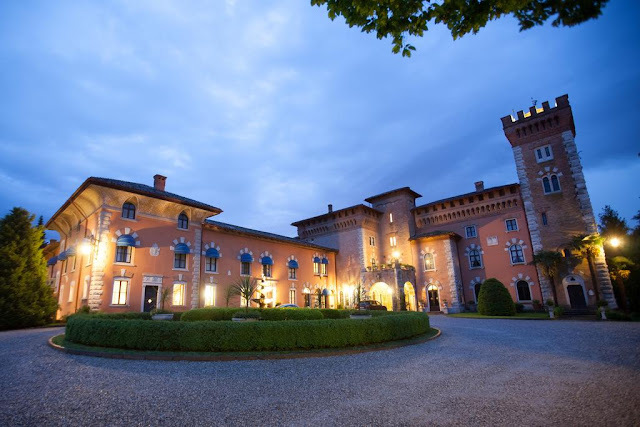 Franciacorta: The hills south of Lake Iseo, in the province of Brescia, are covered with vineyards, dotted with small villages, towers and medieval castles, palaces and noble villas. The name "Franciacorta" comes from francae curtes, the small communities of Benedictine monks who during the Middle Ages were exempted from taxes provided they reclamed and cultivated the land entrusted to them. FRANCIACORTA was the first Italian sparkling wine produced exclusively by bottle fermentation (Classical Method) to have obtained the DOCG. Today, with the term "Franciacorta", without the need for other additions, the consumer is able to simultaneously identify the wine, the production area and the method used to produce it. The vines that are usable are the same as Champagne, Chardonnay and Pinot Nero, with Pinot Bianco in place of Pinot Meunier. In the same area, in addition to firm white wines obtained with the same sparkling grapes, red wines are also produced, falling in CURTEFRANCA DOC, Cabernet Franc, Carmanère, Cabernet Sauvignon and Merlot. 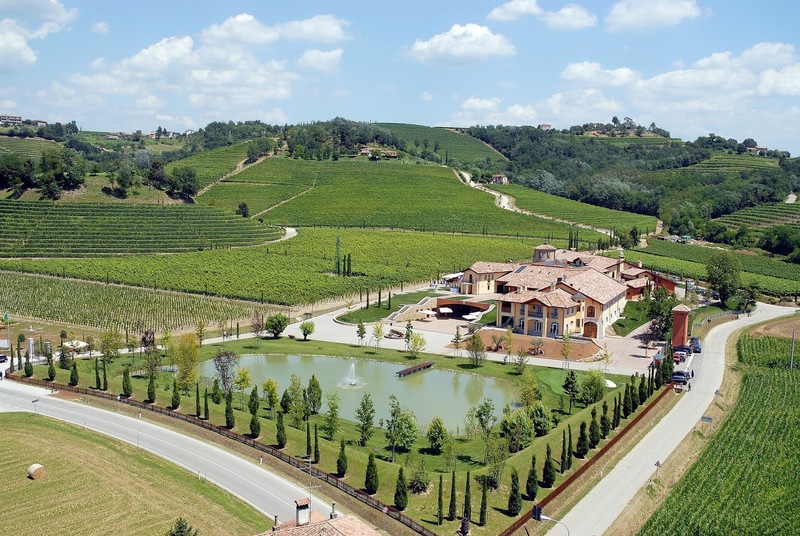 Valcalepio: Zone north of Bergamo, where both white and red wines are produced. Among them is the famous DOCG SCANZ MOSCATE, a dessert red wine with vinegar in purity. Piemonte literally means "at the foot of the mountains", and the term perfectly sums up the physical characteristics of this region, largely surrounded by mountains. The climate is cold-temperate continental, very suitable for grape cultivation. The most cultivated vineyards are certainly those black berries: the Nebbiolo is important for the first time, but other typical varieties are Barbera, Bonarda, Brachetto, Dolcetto, Freisa, Grignolino, Malvasia of Casorzo, Malvasia di Schierano, Pelaverga, Ruchè , Vespolina, etc. Even the white grape vines can not be overlooked: Arneis, Cortese, Erbaluce, Favorita, Timorasso; The most important of all is however White Moscato. The most important wine areas are concentrated in the south-east of Piemonte, particularly between the provinces of Cuneo, Asti and Alessandria. 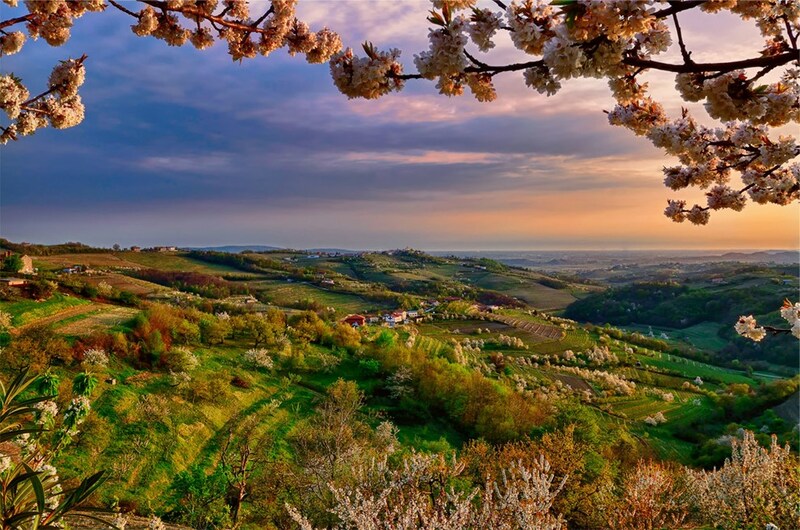 Langhe: In the province of Cuneo, it is one of the most famous and most famous wine areas in Italy. Here, among others, DOCG wines are produced: BAROLO and BARBARESCO, both with Nebbiolo grapes; DOGLIANI and DOLCETTO DIANO D'ALBA, both with Dolcetto grapes; ROERO with Nebbiolo grapes, which becomes ROERO ARNEIS in the white version with Arneis grapes. Also important are DOC BARBERA D'ASTI and BARBERA D'ALBA. 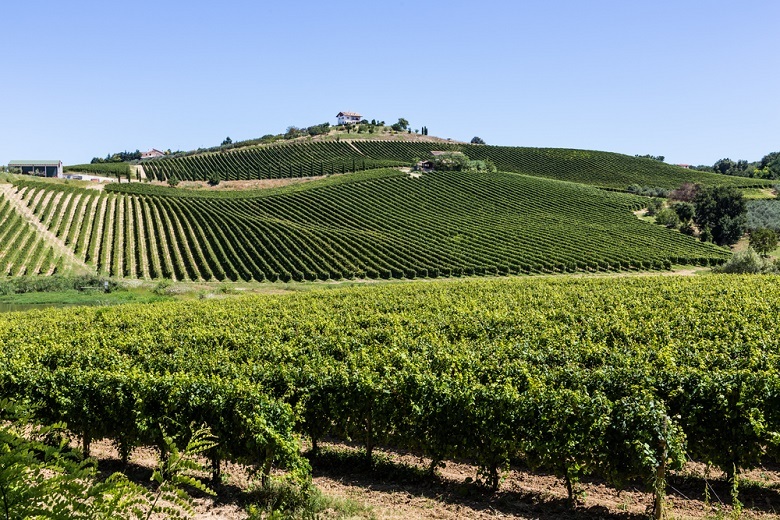 In a more extensive area of traditional Langhe, which defeats in the provinces of Asti and Alessandria, sparkling wines are produced with the classic, white or rosé method, under the name ALTA LANGA DOCG. Monferrato: Located between Asti and Alessandria, it is the home of wines based on Barbera, Freisa and Grignolino. Among the numerous denominations we recall the DOCG: BARBERA DEL MONFERRATO SUPERIORE, DOLCETTO OVADA SUPERIORE, GAVI OR CORTESE OF GAVI, white wine made with Cortese grapes. Astigiano: This area is actually included in the Monferrato, but it is emphasized as it is characterized by the production of famous sparkling wines, generally referatured with the Charmat method, based on Moscato Bianco grapes, which are under the name ASTI DOCG. In addition, this area includes the production area of BRACHETTO D'ACQUI DOCG, a sparkling red wine made from Brachetto grapes, as well as that of the MONFERRATO DOCG CASTAGNOLE RUCK, from the same grapes. Gattinara and Ghemme: The northern part of Piemonte also produces wines of fame and quality, in particular the Gattinara (VC) and Ghemme (NO) communes, where GATTINARA DOCG and GHEMME DOCG are produced, both of Nebbiolo grapes, Which here is called Spana and cut with small percentages of smaller vines. Canavese: The provinces of Turin, Biella and Vercelli extend the Canavese, the territory where cultivated, among others, the white grape variety Erbaluce, which is the basis for the DOCG ERBALUCE DI CALUSO. Small region, with very modest wine production in terms of total volume in the Italian landscape, but on the other hand very interesting from a qualitative point of view. Small productive realities co-operate with a number of cooperative farms to cultivate vineyards in areas ranging between 400 and 1,200 meters above sea level, along the main valley, dug by Dora Baltea, which has a horizontal trend, from West to East. Characteristic of the region is the presence of numerous native vines cultivated exclusively in these areas. Let's remember, among white grapes, Prié Blanc, Petite Arvine, and those red berries Fumin, Petit Rouge, Primate, Vien de Nus, Mayolet and Cornalin. There is also the presence of other vine varieties such as Chardonnay, Pinot Noir, Pinot Grigio, White Moscato, Gewürztraminer, Müller Thurgau, Nebbiolo and Pinot Nero. Another peculiarity of the region is the presence of some crops with vines "on the foot", that is, not grafted on American root. At altitudes above 900 m asl, in fact, phylloxera struggles to survive due to the low temperatures, which allowed the vine to autoctify the Prie Blanc to continue to grow on its original roots. With its grapes it produces what is perhaps the best-known Valdostan wine, the Blanc de Morgex et de La Salle. All wines of this region are grouped in the only DOC VALLE D'AOSTA (or VALLÉE D'AOSTE), which may have some subdivisions such as Blanc de Morgex et de La Salle, Enfer d'Arvier, Torrette, Nus, Chambave, Arnad Montjovet, Donnas. This region is characterized by a narrow territory between the mountains and the sea where grapevine is generally cultivated on the hills in the immediate hinterland, on narrow terraces that allow only manual cultivation operations. 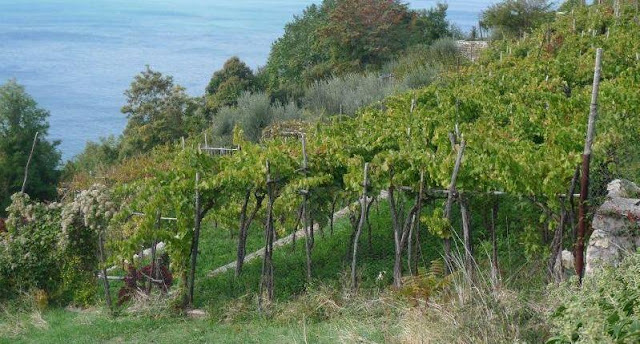 Due to the morphological characteristics, the cultivation of vines in Liguria can not be of great extension, and consequently the productive realities are mostly medium to small. However, quality wines are produced, with very particular characteristics of salinity due to the proximity to the sea. The productive areas extend long along the coast; From the border with France and pursuing eastward we find: ROSSESE DI DOLCEACQUA, ORMEASCO DI PORNASSIO, RIVIERA LIGURE DI PONENTE, VAL POLCÉVERA, GOLFO DEL TIGULLIO‐PORTOFINO, COLLINE DI LEVANTO, CINQUE TERRE, COLLI DI LUNI. 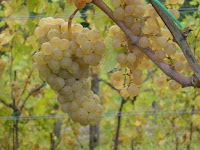 It is cultivated mainly of white berries typical of the region: Vermentino, but also Pigato (a clone of Vermentino), Albarola, Bianchetta Genovese, Bosco and Rollo. Among red grape varieties we find an autochthonous, Rossese, then other grape varieties such as Dolcetto, with which we make the ORMEASCO, Granaccia, Ciliegiolo and Sangiovese. Region characterized by alternating hills and valleys, which seem to be specially designed to accommodate vine cultivation, both in the temperate climate of coastal areas and in the more continental one of the more inland areas. Here are some of the most famous Italian wines in the world. 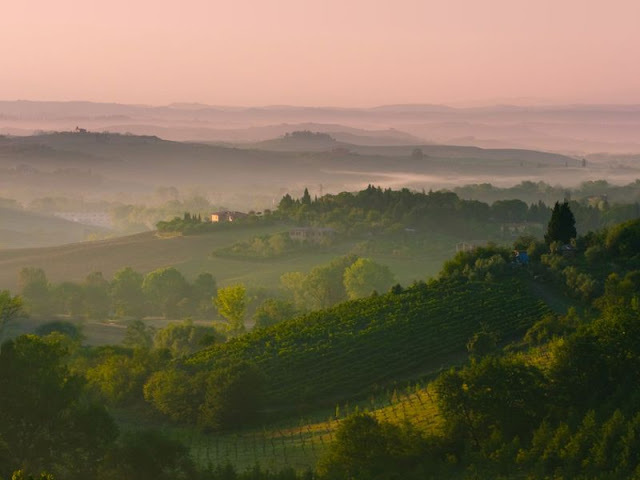 Chianti: In the hills of Chianti, between Florence and Siena, the Sangiovese grape has been cultivated for centuries. This grape, however, in unfavorable vintages, sometimes produced tannic and harsh wines: at the beginning of the 19th century, the use of "tame" this grape was widespread, with other grapes which gave the wine more softness. Around 1840, Count Bettino Ricasoli fixed the composition of the vulture, which subsequently became the historical base of Chianti: 70% Sangiovese, 15% Canaiolo Nero and 15% white grape, Malvasia, followed by The Trebbiano Toscano added. Today, thanks to modern agronomic and vinification techniques, it is no longer necessary to cut Sangiovese to produce quality wines, so the tendency is to vinify Chianti using Sangiovese, if not pure, with small percentages of Cabernet Sauvignon or Merlot. For Chianti there are two denominations: CHIANTI CLASSICO DOCG, which includes the "historic" towns between Florence and Siena, and CHIANTI DOCG, which includes a vast area between the provinces of Pistoia, Prato, Florence, Pisa, Siena and Arezzo (Chianti DOCG area is divided into seven sub-regions: Colli Fiorentini, Rufina, Montalbano, Montespertoli, Colli Senesi, Colli Aretini, Colli Pisani). Montalcino: This area, in the province of Siena, is the homeland of the renowned BRUNELLO DI MONTALCINO DOCG, made from grapes of Sangiovese grosso (locally called Brunello), purified vinified. Wine of good longevity, in some versions of excellence can be outstanding even after decades from bottling. Its origins date back to the second half of the nineteenth century, although the boom of Brunello di Montalcino is much more recent (late '90s). Montepulciano: Still in the province of Siena, but now near the border with Umbria, in the only municipality of Montepulciano you can produce the NOBILE WINE OF MONTEPULCIANO DOCG, always based on Sangiovese, here still called Prugnolo Gentile, to which it can be added A small percentage of Canaiolo Nero and other vines also in white berry. Bolgheri: This is the "new" area of the great Tuscan wines famous in the world: here, on the hills of the Livorno coast, in the municipality of Castagneto Carducci, in the middle of the 20th century Count Mario Incisa della Rocchetta began cultivating some plants of Cabernet Sauvignon And Cabernet Franc coming directly from the Bordeaux area. So the famous Sassicaia was born, which now falls into the DOC BOLGHERI, where Merlot, Syrah and Sangiovese can also be used, as well as white grape vines. San Giminiano: In a region, Tuscany, dominated by red berries, the "white fly" is represented by the hills of the municipality of San Giminiano, where the rows of Vernaccia of S. Giminiano, which make up the base of the wine White the same name VERNACCIA DI SAN GIMINIANO DOCG. Carmignano: In this area near Prato was born CARMIGNANO DOCG, one of the oldest wines in Italy, always based on Sangiovese and Canaiolo Nero, with additions, also significant, of other vines, both black and white. Scansano: In the Grossetan Maremma, near the municipality of Scansano, the MORELLINO DI SCANSANO DOCG is produced, predominantly based on Sangiovese, locally called Morellino. The passage between the North and the Center of Italy, from the point of view of wine, actually respects what is the natural historical division of the two sub-regions: Emilia, characterized by a more continental climate, and Romagna with a more temperate climate The proximity to the sea. Vineyard farming is practiced both in the hillside and in the plain, where mechanization of cultivation and harvesting is particularly developed. This region is a major producer of DOP wines (about 11% of national production), but above all of IGP wines and wines without geographical indication, destined for large distribution. The most cultivated vineyards, starting from the northwest to descend to Romagna, are as regards the whites Ortugo, Malvasia of Candia Aromatica, Grechetto Gentile, Montù, Pagadebit, Trebbiano Romagnolo and Albana, and, with regard to reds, Barbera , Croatina, Lambrusco in its innumerable varieties, Fortana and Sangiovese. Huge diffusion also have international vines Chardonnay, Sauvignon Blanc, Merlot and Cabernet Sauvignon. Piacentino: This territory is affected by the proximity to Tortonese and Oltrepò Pavese, and for this reason, the vineyards Barbera and Croatina (locally called Bonarda) are very popular, which together form the famous red wine GUTTURNIO DOC. Regarding whites, ORTRUGO DOC is the most important, although Malvasie is very widespread. Land of the Lambruschi: The provinces of Raggio Emilia and, above all, Modena are the kingdom of Lambruschi. It speaks to the plural because there are actually different varieties of Lambrusco grapes (Sorbara, Grasparossa, Salamino, Maestri, Marani, Fiorano, Barghi, Oliva, Montericco, Viadanese or Mantuan), all vinificate in order to give the famous Sparkling wine, drink young, in dry or sweetish version. Colli Bolognesi: This area represents the border of oenologic Emilia : already from Imola, in fact, is in full "Romagna of wines". 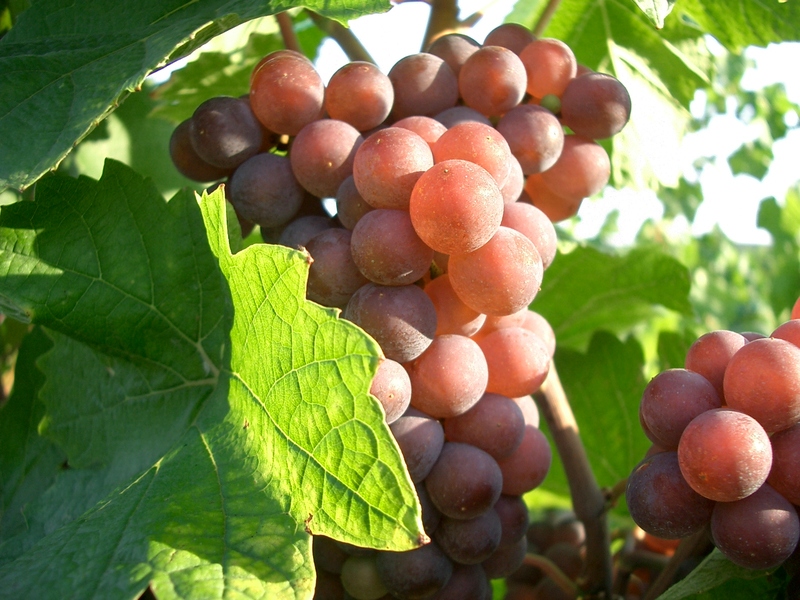 In Bologna, an autochthonous grape variety is prevalent on all: Grechetto Gentile, vinified in firm, sparkling or sparkling varieties to give Pignoletto wines. The COLLI BOLOGNESI CLASSIC PIGNOLETTO version, produced in the area of the oldest tradition, is dedicated to DOCG. In this area historically the wines are sparkling, so Barbera (or "Barbera" as is often called by Bolognese) is often sparkling vinified . Romagna: From Imola, passing through the Faenza, descending towards the south east sea, and towards the southwestern Apennine, enters full Romagna, an area of ancient tradition in the winegrowing of Trebbiano and Albana with regard to whites , And especially of Sangiovese as far as the reds are concerned, of which they have the products of excellence in the historical heart of Predappio and Bertinoro. It is worth mentioning ROMAGNA ALBANA DOCG, the first white wine in Italy to obtain the "Controlled and Guaranteed Denomination of Origin" 10. The grape Albana probably finds its highest expression in the type of "passito" wine given its propensity to develop a high degree of sugary and consequently high potential alcoholic strength. The cultivation of the vine in the Marches mainly concerns the hilly areas running parallel to the coastal strip. Marche is one of the Italian regions that have devoted themselves to the enhancement of native grapes, with no doubt positive results. 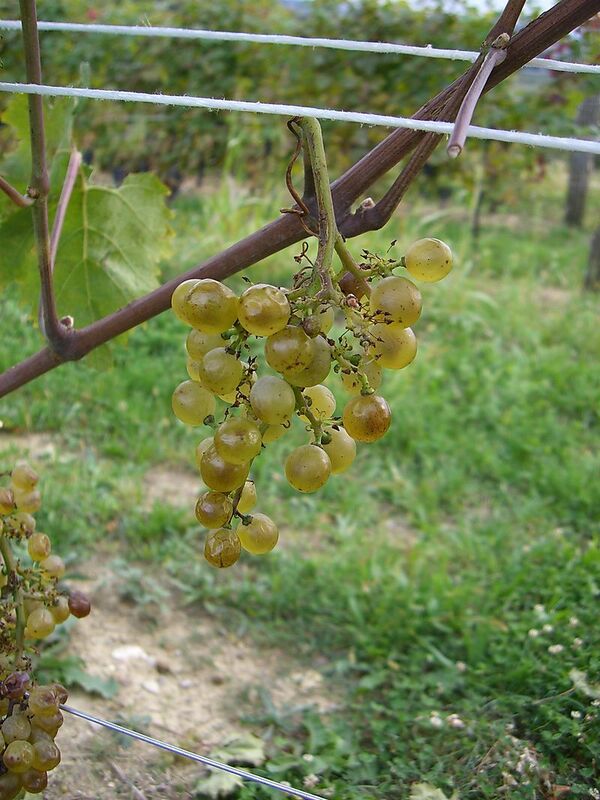 Among them stands out all over Verdicchio, white grape berries that can give important structure to the wines that come from it. Promising results are also giving Pecorino and Passerina. Trebbiano Toscano is also very cultivated. 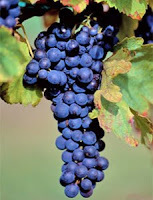 Black grape varieties have also been very successful, especially Montepulciano (often cut with Sangiovese wines), Lacrima di Morro d'Alba and Vernaccia Nera. Herewith are the most important wine areas. Castles of Iesi and Matelica: Hills between the provinces of Ancona and Macerata are the homeland of the famous VERDICCHIO DEI CASTELLI DI IESI and VERDICCHIO DI MATELICA, wines with Denomination of Controlled Origin that in their respective types "Riserva" belong to the DOCG. Verdicchio is certainly the most important wine in the region, and one of the whites that has reached an average quality level among the highest in Italy. Conero: This is a hilly area on the promontory of Monte Conero, near the sea, south of Ancona. Here you can find the grape Montepulciano, which sometimes cut with a small percentage of Sangiovese, gives rise to CONERO DOCG and ROSSO CONERO DOC, very special red wines, characterized by the influx of sea breezes and calcareous soil. Morro d’Alba: It is a hilly area in the northern part of the province of Ancona, where since the 1980s a local vineyard was threatened with extinction, called Lacrima, perhaps because of the elongated shape of the oak or perhaps because when it is mature , Exudes juicy droplets of tear. If you get a red wine, LACRIMA DI MORRO D'ALBA DOC, rather soft, with distinct scents of berries and rose. Piceno: A very extensive and heterogeneous area, which embraces virtually all of the southern part of the region, from the province of Ancona to Ascoli Piceno. In this area, the RED PICENO DOC is produced, mainly based on Montepulciano and Sangiovese. Serrapetrona: In this very narrow area in the province of Macerata, a vintagable wine is produced, the VERNACCIA DI SERRAPETRONA DOCG, based on Vernaccia Nera. The peculiarity of this wine consists of being a red sparkling wine, vinified both dry and sweet, with a unique process of its kind, that is, a triple fermentation: part of the grapes is poured and fermented together with the wine already produced by the part of fresh grapes. Offida: This is the area of choice for Pecorino and Passerina, two white grape vines recently re-valued. Pecorino in particular is a vine that has risked extinction, and is now giving very interesting results, producing hot, thick wines and vibrant acidity. Here also produce red wines with Montepulciano grapes. Hilly territory, strewn by the Tiber and its tributaries, which has ancient vine cultivation traditions. White and red wines are produced more or less in equal measure, although perhaps the latter give the most interesting results. 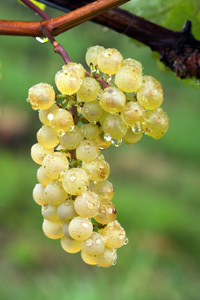 The most important white berries are the Trebbiano Toscano (here called Procanico), the Grechetto di Orvieto, the Greco di Todi, the Verdello. Among those with black berry are Sangiovese and Sagrantino. Torgiano: Small portion of territory near Perugia, where, mainly from Sangiovese grapes, the TORGIANO ROSSO RISERVA DOCG is obtained, elegant and well-structured wine. Under the TORGIANO DOC zone white wines are produced, mostly with Trebbiano and Chardonnay grapes. Montefalco: Another hilly area in the province of Perugia, in the vicinity of the town of Montefalco, famous especially for the production of what is perhaps the most famous Umbrian wine, MONTEFALCO SAGRANTINO DOCG, produced exclusively with Sagrantino grapes, which give rise to one of the Tannins that are richer in the whole peninsula. 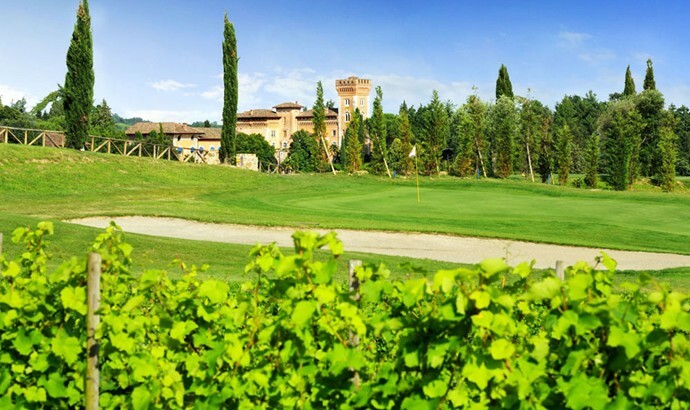 Other wineries are the Colli Martani, the Colli del Trasimeno, the Colli Perugini and the Orvietano. A predominantly mountainous region, where the vine cultivation is concentrated on the hillsides that degrade to the Adriatic Sea. In this region, two vines dominate all the others: the Trebbiano d'Abruzzo between the whites and Montepulciano among the reds, with which are produced also interesting rosé wines, under the name CERASUOLO D'ABRUZZO DOC, practically practiced throughout the region. Colline Teramane: In the north of the region, on the border with the Marche, with the vinification of Montepulciano grapes and a small percentage of Sangiovese grapes, MONTEPULCIANO D'ABRUZZO COLLINE TERAMANE DOCG is produced, which can also be used for aging, especially in the " Reserve". Controguerra: In a small portion of the land, situated to the sea just on the border with the Marche, in the neighborhood of the municipality of Controguerra, is produced the CONTROGUERRA DOC, a denomination that includes both white and red wines, also sparkling or passive, always on a prevailing basis Trebbiano or Montepulciano. NOTE on MONTEPULCIANO: Many fall into the ambiguity of confusing the Nobile Wine of Montepulciano with Montepulciano d'Abruzzo. The first is a Tuscan wine made from Sangiovese grapes, produced around the town of Montepulciano; The second is an DOC wine of Montepulciano grapes from Abruzzo. The Montepulciano vine is spread in all Adriatic regions, from the Marches down, and nothing has to do with the Sangiovese of the Nobile Wine of Montepulciano. Bordering on the Abruzzo region, shares the morphological characteristics, so the wine-growing areas are predominantly the hilly terrain that descends to the sea, stranded by the river Biferno. As with Abruzzo, the Trebbiano of Abruzzo and Montepulciano vines are certainly the most popular, and are the main ampelographic bases for the DOC PENTRO D'ISERNIA and BIFERNO. There is, however, growing throughout the region the cultivation of an autochthonous grape, the black berry, which, vinified in red or rosé, has recently gained greater value through DOC TINTILIA DEL MOLISE. A wide and morphologically heterogeneous region, clearly oriented towards the production of white wines. Some areas of volcanic origin are distinguished, especially for the cultivation of vines: Colli Albani, Marino, Frascati, Castelli Romani, where white wines are produced with Malvasia Bianca of Candia, Malvasia del Lazio, Trebbiano, Bianco Bombino or Greco. Piglio: Territory in the province of Frosinone near the town of Piglio, where the CESANESE DEL PIGLIO DOCG is produced, red wine predominantly derived from Cesanese grapes of Affile or Cesanese Comune. Frascati: Famous area in the territory of the Roman Castles in the South of Rome, there are the FRASCATI SUPERIORE DOCG, FRASCATI DOC and CANNELLINO DI FRASCATI DOCG, white wines based on Malvasia Bianca di Candia, Malvasia del Lazio, Trebbiano Toscano, Trebbiano Yellow, White or Greek Bombino. 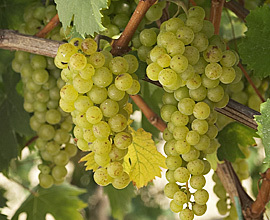 Cannellino differs from other Frascati because it derives from late grapes. Castelli Romani: A wide wine area that, in practice, covers the entire territory between Rome and Latina. White, rosé and red wines are produced, the first based on the mentioned malvasie and trebbiani, the second based on Cesanese, Merlot, Montepulciano or Sangiovese. Gradoli: In a territory partially coinciding with that of the East! EAST!! EAST!!! OF MONTEFIASCONE, in the vicinity of the town of Gradoli, the Aleatico grape vines are vinified to give birth to a passito or liqueur wine, The ALEATIC OF GRADOLI DOC. Campania has a high-quality wine tradition already in Roman times. The territory is morphologically very heterogeneous: mountainous, hilly, flat, or even insular, with land of various origins and nature, allow the production of a wide range of wines, very different from each other. There are also many cultivated vines. Irpinia: In this area, in the province of Avellino, the most famous bells are produced: FIANO DI AVELLINO and GRECO DI TUFO between whites and TAURASI among reds, all DOCG wines, whose main grapes originate are Fiano, Greco and Aglianico. It is a land that is morphologically present as an intricate of valleys and hills, among which many rivers and streams wind through, characterized by a stormy winter and cool summer climate, with significant thermal excursions between night and day, situations Ideal for grape cultivation. Sannio: In the province of Benevento, it is a mountainous area groomed by river valleys. Here the most important white berry is Falanghina, a main component of several DOC wines, while the main black berry is still the Aglianico, a basic grape to make the AGLIANICO DEL TABURNO DOCG. Penisola Sorrentina, Carpi and Ischia: here, next to the Falanghina, one cultivates, amongst others, a particular red berry, Piedirosso (or Per 'and Palummo, the name derives from the color that the rachide takes shortly before harvest, when it becomes "red as the foot of a dove "). Vesuvio: Volcanic origin area from which come pleasant wines, mainly based on Coda di Volpe and Piedirosso if it is red. The wines of this VESUVIO DOC (white or red) may be given the particular name Lacryma Christi in particular conditions and alcohol volume. The cultivation of vines in Puglia has very ancient origins, since the first Greek settlers crossing the Ionian Sea landed on these coasts. It is a region almost completely devoid of mountains, characterized by the alternation of hills, highlands and plains. It is usually poor in water (except for Tavoliere), with warm, arid climate and low precipitations; However, is well ventilated, thanks to the constant proximity to the sea. 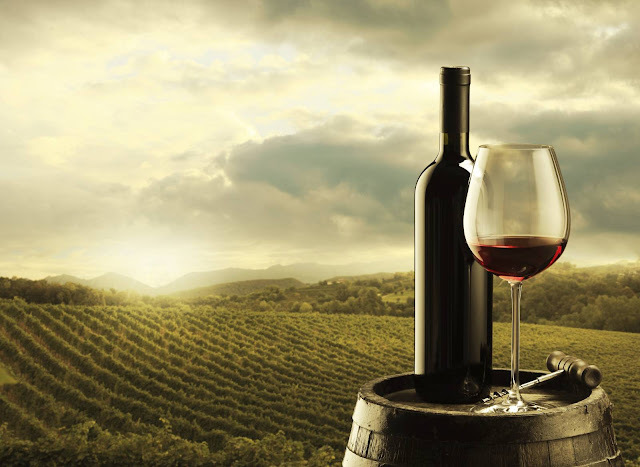 In the south dominate all the most famous varieties of Puglia: Primitivo and Negroamaro. 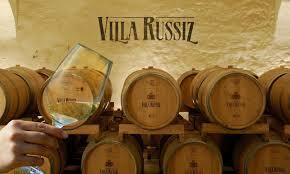 Apulia is one of the largest wine producing regions in Italy, and in particular it is famous for producing rosé wines. 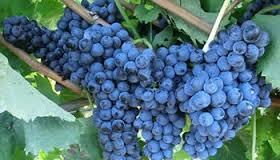 Salento: In the Salentine Peninsula, due to the very warm climate, black berry grapes are grown. Among these predominant is Negroamaro, with which are produced red and rosé wines. The most significant DOCs are SALICE SALENTINO and BRINDISI. Salento tarantino (Messapia): In the Salentine area called Messapia, overlooking the Gulf of Taranto, lies the municipality of Manduria, home to the election of the MANDURIA DOC PRIMITIVE, which in the passage becomes PRIMITIVE OF MANDURIA DOLCE NATURALE DOCG. The grape used is the Primitive. Locorotondo: In the surroundings of the town of Locorotondo, between the provinces of Bari and Brindisi, it produces what is perhaps the most important white wine of Apulia, LOCOROTONDO DOC, predominantly based on Verdeca and Bianco d'Alessano. Murge occidentali: Between Barletta and Bari, where Castel del Monte, the fortress of Emperor Frederick II, rises, there are red wines based on Black Bombino or Black of Troy. We have CASTEL DEL MONTE BOMBINO NERO, CASTEL DEL MONTE NERO DI TROIA RISERVA, CASTEL DEL MONTE ROSSO RISERVA all DOCG; CASTEL DEL MONTE DOC also allows the production of white or rosé wines. In this region the cultivation of vine is not very practiced. The main grape is undoubtedly the Aglianico, cultivated above all in the Vulture, a hilly area north of Potenza, bordering on Puglia, near an inactive volcanic site. These volcanic soils are well adapted to the cultivation of vines, and have given rise to the most prestigious Lucan wine, AGLIANICO DEL VULTURE DOC, which assumes the DOCG version of the AGLIANICO DEL VULTURE SUPERIORE. Other Basilicata varieties are Basilicata Malvasia Bianca and Basilicata Malvasia Nera, cultivated in other smaller wine areas (TERRE DELL'ALTA VAL D'AGRI, MATERA and GROTTINO DI ROCCANOVA) together with international vines (Cabernet Sauvignon, Merlot) and "imported" vines from neighboring regions (Montepulciano, Primitivo, Sangiovese). Il territorio calabrese è costituito in gran parte da montagne e colline circondate dal mare, in modo tale che il passaggio dall’ambiente montano a quello marino è particolarmente breve. This orographic feature, combined with a temperate climate, makes Calabria a region, at least on paper, potentially suited to the cultivation of vines. Unfortunately, still today, Calabrian wines have not yet been adequately valued, despite the availability of numerous native grape varieties, in particular black berries (Gaglioppo, Magliocco Canino, Marsigliana Nera, Nerello Mascalese, Prunesta). The most important wine-growing area is certainly Cirò. Territory in the northern part of the province of Crotone around the town of Cirò is the homeland of DOC CIRÒ, which is by far the most famous in Calabria: about 90% of Calabrian DOC wines come from here. It is generally thought that Cirò is a red wine based on Gaglioppo, but in fact under this denomination also white-based wines are produced. It is a region with an area particularly suitable for the cultivation of vines, both for predominantly mountainous and hilly morphology, and for the indisputably Mediterranean climate. In recent decades, local wines have begun to be valued as such, and the quality level has increased considerably. In Sicily the production of white wines is prevalent, but the production of red wines is also significant, with strong qualitative growth. Here, however, excellent excellent wines are produced. There are many native grape varieties: among those white berries we call Catarratto Bianco, Inzolia, Grillo, Carricante, Grecanico Dorato, Zibibbo, Malvasia di Lipari, Minnella Bianca, Moscato Bianco; while among those black berries we remember Nero d’Avola, Nerello Mascalese, Nerello Cappuccio, Frappato, Nocera, Perricone. 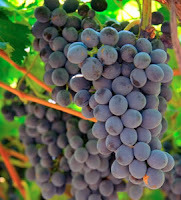 International grapes are also very popular, especially Syrah. Trapanese: This area, which corresponds to the westernmost tip of the island, deserves to be the first place not so much because it is the region's most productive area but above all because it includes the production area of MARSALA DOC, the fortified wine that has celebrated the wines of Sicily in the world. Vittoria: In the south of the region, between the provinces of Ragusa, Caltanissetta and Catania, is produced the CERASUOLO DI VITTORIA DOCG, a cherry-colored wine, based on Nero d'Avola and Frappato. Etna: At the slopes of Mount Etna, even at heights that touch the 1000 mt s.l.m., the vine has found an ideal habitat, both for volcanic soils and for significant thermal excursions. Here are some interesting results with the Carricante vine, white berry, and the Nerello Mascalese, black berry. The naming reference is ETNA DOC. Siracusano: This area is mainly due to the production of two dessert passiti, Moscato di Siracusa and Moscato di Noto, both based on Moscato Bianco. Lipari: In the Aeolian Islands, the very famous MALVASIA DELLE LIPARI DOC is produced, in the sweet, passito or liqueur types. 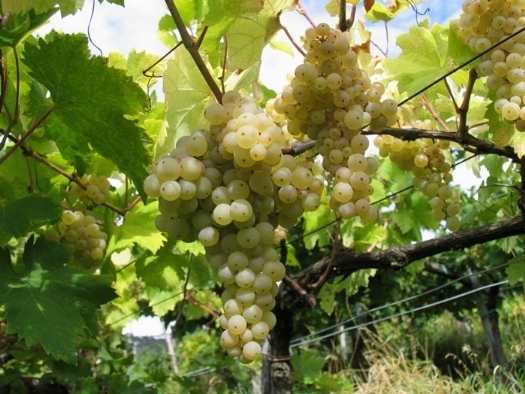 The main vine is Lipari Malvasia, white berry, to which a small percentage of Corinto Nero is added. Pantelleria: In the remote island of Pantelleria, halfway between Sicily and Tunisia, the Zibibbo is cultivated to give place to the MOSCATO OR PASSITO OF PANTELLERIA DOC. This vine is cultivated in saplings dug into the ground to defend the plant from the wind and preserve it from drought.. This great island is morphologically characterized by alternating mountains, hills and highlands, while the plains are less frequent, except for the great field of Campidano in the south. The climate is of Mediterranean type, usually with little precipitation, but the great summer heat of the most central areas is mitigated by the almost constant presence of temperate winds .. However, the wine production of this region, not high in volumes, is still noteworthy, also due to the wide presence of numerous native vines, most often only present on this island. We find ourselves, among the white grape varieties: Malvasia of Sardinia, Nasco, Nuragus, Semidano, Torbato, Vermentino, Vernaccia of Oristano; and among black grape varieties: Cannonau, Carignano, Cagnulari, Gurò, Monica, Nieddera, Pascale and many others. Gallura: This territory to the north of the island is the homeland of VERMENTINO DI GALLURA DOCG, white wine made with Vermentino grapes, a typical grape of the coastal areas that we find also in Liguria and Tuscany. Sulcis: Area in the southwestern part of the island, between Iglesias and Cagliari, is known for the CARIGNANO DEL SULCIS DOC, a delicious red wine (or rosé) very full bodied with Carignano grapes. Oristano: Here, in the western part of the island, the ORISTANO VERNACCIA DOC is produced, with white berry names. It can be suitable as an aperitif, but is often made sweet or liqueur, in which case it accompanies spicy cheeses or dry pastries. Cagliari: The area of Cagliari, together with that of Oristano, is especially famous for the production of passito or liqueur wines, including MALVASIA DI CAGLIARI, MOSCATO DI CAGLIARI, NASCO DI CAGLIARI. This is the introduction to the subdivision of Italian regions and productive areas. In the next posts, however, a more detailed description of each area will be given and the main producers will be described with the description of the vines and wines. In case you are curious to visit the places described we have put a direct link to booking.com in the right sidebar, one of the most important for pernotations in Italy and if you would like to drink the best Italian wines in the next posts we will also place of references for the purchase. Thanks for following us. Work is very complex but we carry it with the utmost dedication, and do not forget to include any comments if you have any doubts or opinions about the topics discussed.